The current BBC television adaption of Winston Graham's Poldark novels has taken the nation by storm. Whilst some of this may be due to the rip-roaring period drama itself at least some of that success has been down to the stunning locations that Cornwall has provided. The Poldark novels are set in Georgian times (around 300 years ago). 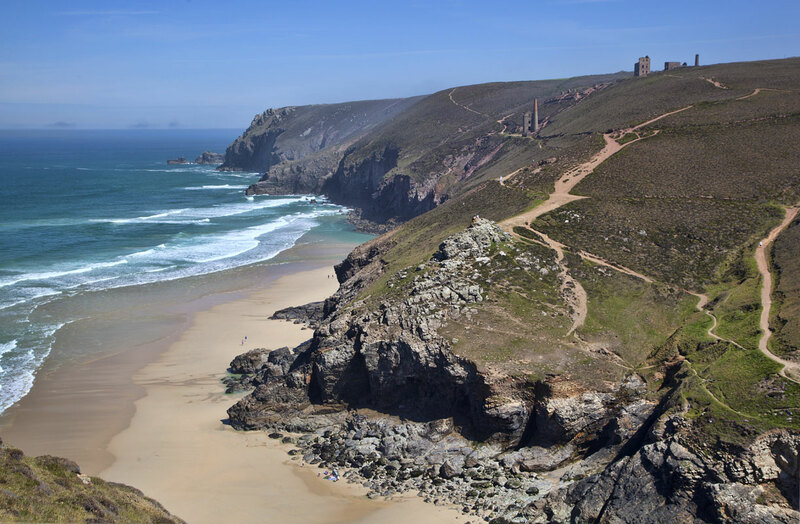 Whilst virtually every other aspect of the British landscape has changed over this period, the view out over much of Cornwall's coast remains just as it was in the days Poldark was set. 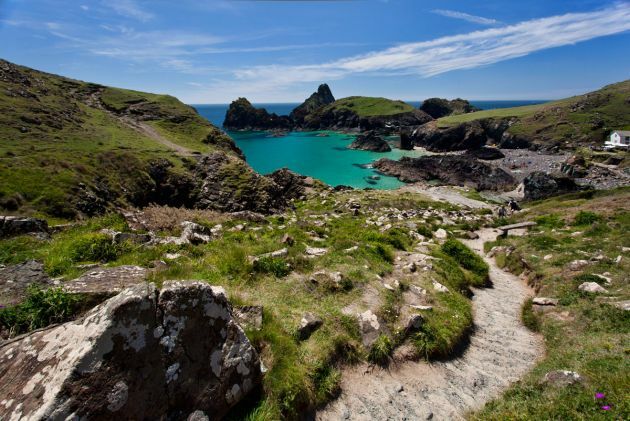 Cornwall is dominated by coast so it is little wonder many of the film locations used in Poldark are coastal. 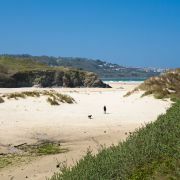 The novels feature fictional places such as Nampara Cove, Hendrawna Sands, the Poldark's beach and the Warleggan's beach. 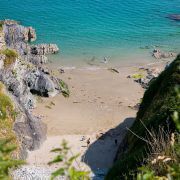 Whilst these places may not actually exist some refer to real places and others have been selected from the very best of our unspoilt Cornish beaches. Kynance Cove is located near the tip of the Lizard Peninsula and is one of Cornwall's most spectacular and recognisable beaches. 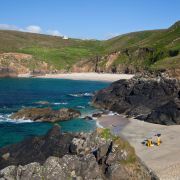 With its brilliant turquoise waters, white sand, sea caves and towering serpentine rocks it isn't hard to see why Poldark's film-makers couldn't resist using the National Trust owned cove for certain scenes of Nampara. Tucked away, just a couple of miles around the coast from Land's End is the tiny fishing cove of Porthgwarra. Part of the St Aubyn Estate, for many years the cove, with its clutch of cottages and little cafe, was off the beaten track to say the least. However, its charms did not escape Poldark's makers. With crystal clear waters, tunnels cut through the rocks and a cobbled slipway Porthgwarra was used in several scenes of the TV series. The best known of these scenes was where Ross Poldark takes an early morning swim whilst Demelza secretly looks on. 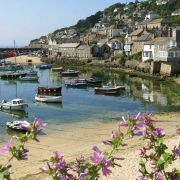 Another important scene filmed here is where Ross gives Mark his boat so he can sail to France to evade arrest after the death of Keren, his wife. 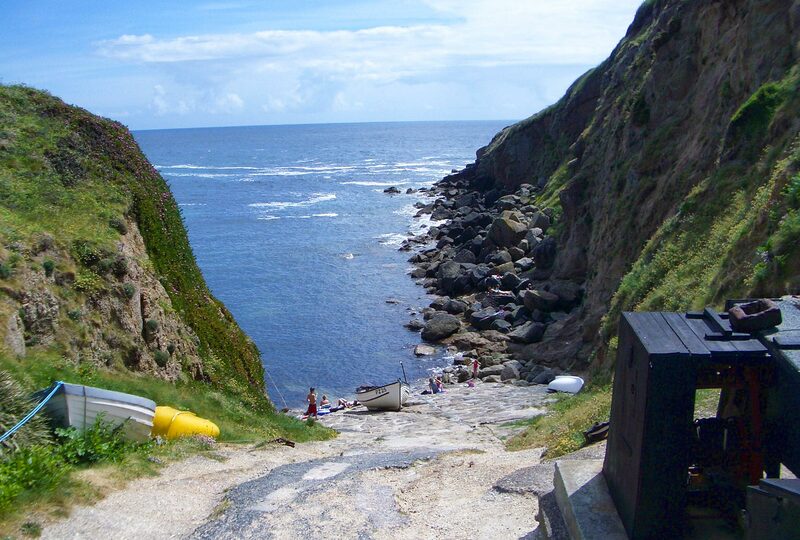 Porthgwarra was also used as the location for the scene where the pilchard catch was landed. This is as far north as the Poldark filming went in Cornwall; to the edge of the Camel Estuary and the beaches and cliffs around Padstow. The scenes here were filmed from the cliffs of Lellizick and out towards Stepper Point. The views from here are quite spectacular and unspoilt, taking in the beaches of Hawkers Cove and Tregirls beach which extends into the Camel Estuary to form the notorious "Doom Bar". 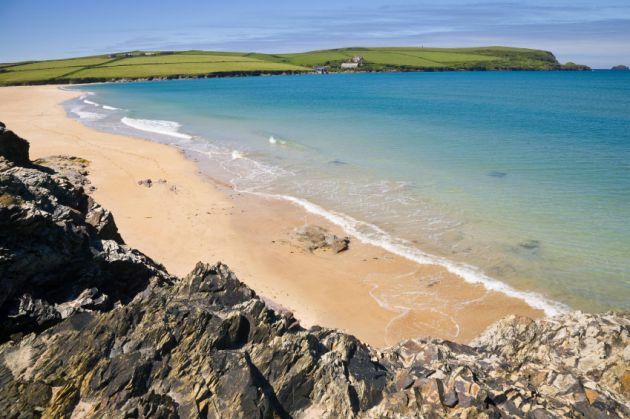 These beaches are just a couple of miles from the buzzing harbour town of Padstow but only a tiny fraction of visitors ever make it that far. Gunwalloe Cove - a wreckers delight! Also on the Lizard Peninsula, but several miles closer to civilisation, is the little sandy cove of Gunwalloe. The beach here is also known as Church Cove on account of the fact that (as you can see) there is a church practically on the beach. This15th century church is dedicated to St Winwaloe and is unusual in that bell tower is completely detached from the church itself. But I digress! What has this got to do with Poldark? Well, this is the cove where the night-time ship wrecking scenes for the TV series were filmed. Whether or not it is coincidence, the adjoining cove of Jangye Ryn is also known as Dollar Cove as it is said to have been the site of two shipwrecks involving treasure-laden ships. The first a Portuguese galleon in 1526 and then a ship carrying silver dollar coins in 1783. It is said if you are lucky you can still find the silver dollars amongst the pebbles. 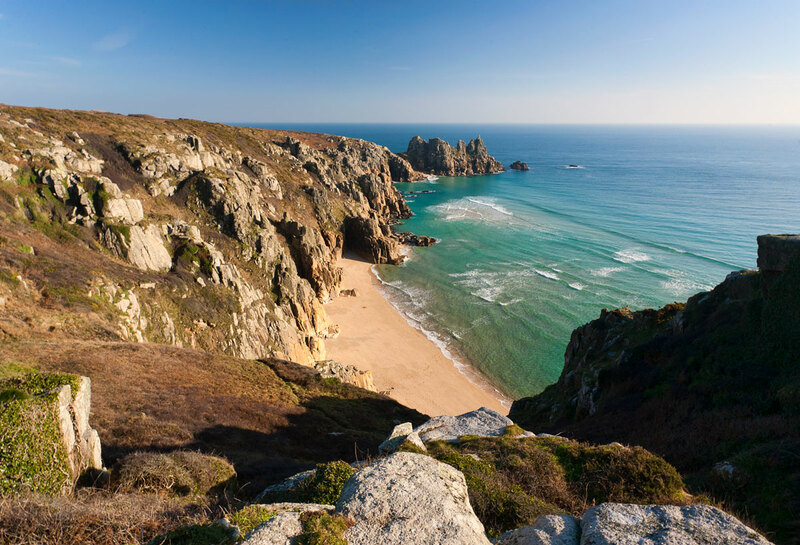 Just around the corner from Porthgwarra is Porthcurno Cove which has to be one of the most stunning spots in all of Cornwall. Often featured on the covers of holiday brochures and the likes this beach is instantly recognisable by its craggy granite cliffs, near whites sand and incredible turquoise water. With such an array of natural beauty it is little surprise the beach here was chosen by the location manager to feature as Nampara Cove. Most memorable of these scenes is in episode two where Ross and Demelza walk across the beach towards the cliffs of Teryn Dinas and Pedn Vounder in a dream sequence. Whilst Perranporth has yet to feature in an episode it gets an honorary inclusion on this list as it was the home of Wiston Graham, Poldark's author. It is actually referred to in the novels as "Hendrawna Sands". Graham moved to the seaside town with his family when he was 17 years old and spent much of his life here. 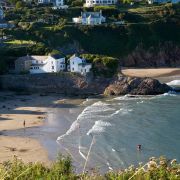 It was during the 1940s that he wrote the first of the Poldark books from the family home - a weatherboard bungalow named "Flat Rocks/ Lech Carrygy" which had a spectacular location on the headland you can see in the photo above. Today the bungalow is gone, but in its place is a stone memorial bench overlooking this fantastic and inspirational beach. 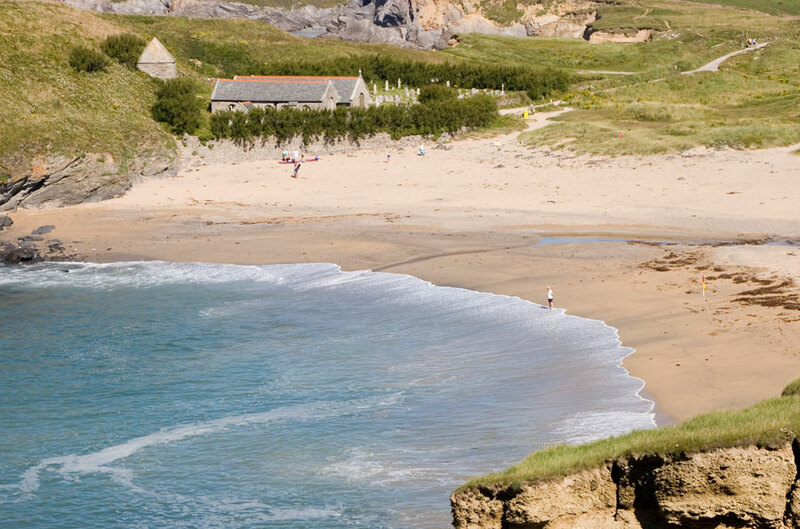 Situated roughly halfway between Newquay and Perranporth is the wide open beach at Holywell Bay. Like Porthcurno and Kynance coves Holywell is also owned by the National Trust. 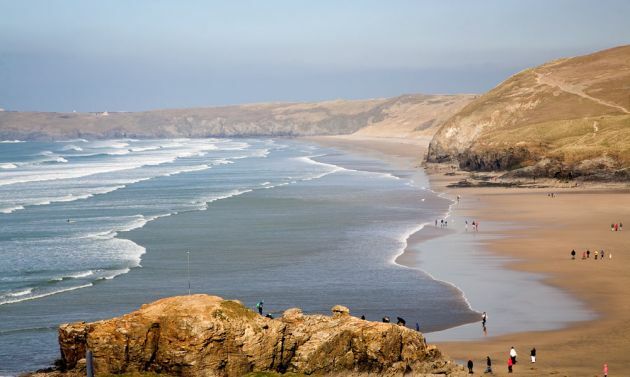 As well as the vast sweep of golden sand backed by grass-tufted sand dunes, Holywell is instantly recognisable by the huge twin rock islands which sit a quarter mile off the beach. These slate stacks are known as Carter's or Gull Rocks and stand as high as the adjacent cliffs of Penhale Point. 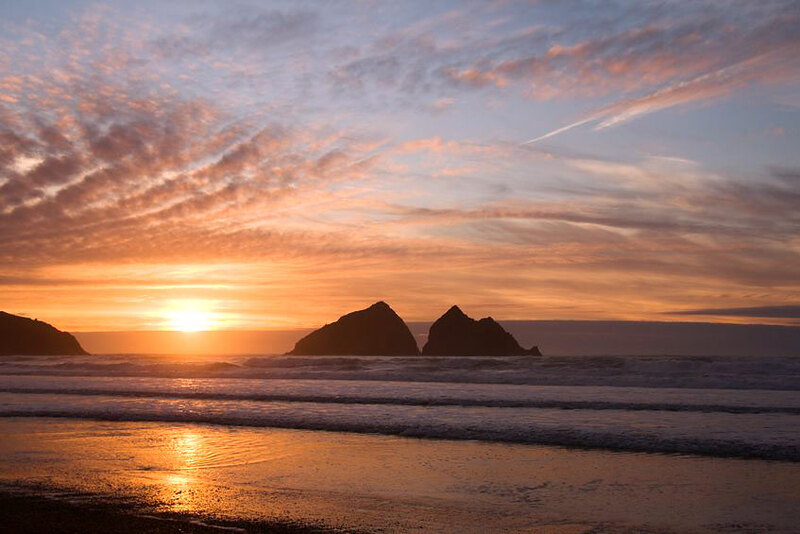 This dramatic backdrop to the windswept sands made Holywell the ideal choice for the Warleggan's beach in the second series of Poldark. 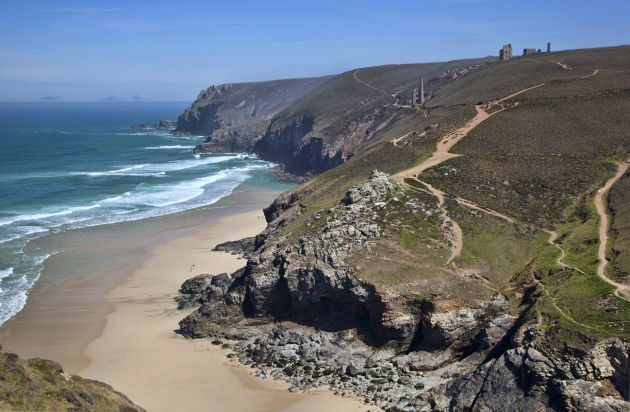 The stretch of coast between Chapel Porth beach and St Agnes head is some of the best known and most dramatic mining country in all of Cornwall. Whilst today the National Trust owned Chapel Porth beach draws visitors for its natural beauty and great surf, a couple of hundred years ago it was a very different scene. The cliff tops here were at the heart of the local tin mining industry and there are few engine houses as famous as Wheal Coates, sited on the cliffs directly above the beach. In the 1870s this engine house was used to pump water out of the Towanroath shaft which went down 600 feet below the beach. With such a dramatic backdrop it is little wonder the coast here features in many of Poldark's gallops along the rugged clifftops. Despite the fact the mines workings here were only built 100 years after Poldark was set it would be a crime not to include this most Cornish of landscapes! 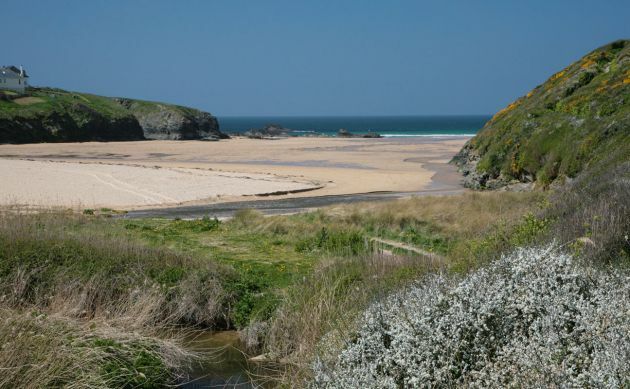 Porthcothan Bay is located just far enough from Newquay and just far enough from Padstow to escape the summer crowds. 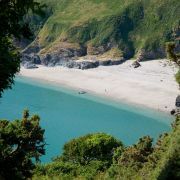 In fact it is one of the lesser known beaches on the North coast, which only adds to its appeal. The beach here is a lovely expanse of golden sand flanked by cliffs to either side. To the rear of the beach are low sand dunes and a little river that snakes its way down to the sea. There was once an impressive rock arch at the southern end of the beach but this was destroyed in the great storms of 2014. Porthcothan was used in the Poldark filming for some scenes involving the landward side of Nampara. The beach itself was also used for some shots of Hendrawna Beach. Just around the corner from Porthcothan is Park Head. This was used in some of the scenes involving Ross Poldark galloping across the clifftops with the spectacular Bedruthan Steps in the distance.